For other uses, see The Woman in Black (disambiguation). The story begins with Arthur Kipps, a retired solicitor who formerly worked for Mr. Bentley. One night he is at home with his wife Esme and four stepchildren, who are telling ghost stories. When he is asked to tell a story, he becomes irritated and leaves the room, and begins to write of his horrific experiences several years in the past. Many years earlier, whilst still a junior solicitor for Bentley, Kipps was summoned to Crythin Gifford, a small market town on the north east coast of England, to attend the funeral of Mrs. Alice Drablow. Kipps is reluctant to leave his fiancée, Stella, but he is eager to leave the London smog. The late Drablow was an elderly and reclusive widow who lived alone in the desolate and secluded Eel Marsh House. The house is situated on Nine Lives Causeway. At high tide, it is completely cut off from the mainland, surrounded only by marshes and sea frets. Kipps soon realizes there is more to Alice Drablow than he originally thought. At the funeral, he sees a woman dressed in black and with a pale face and dark eyes, whom a group of children are silently watching. While sorting through Mrs Drablow's papers at Eel Marsh House over the course of several days, he endures an increasingly terrifying sequence of unexplained noises, chilling events and appearances by the Woman in Black. In one of these instances, he hears the sound of a horse and carriage in distress, closely followed by the screams of a young child and his maid, coming from the direction of the marshes. Most of the people in Crythin Gifford are reluctant to reveal information about Mrs Drablow and the mysterious woman in black. Any attempts by Kipps to find out the truth causes pained and fearful reactions. From various sources, Kipps learns that Mrs Drablow's sister, Jennet Humfrye, gave birth to a child, Nathaniel. Because she was unmarried, she was forced to give the child to her sister. Mrs Drablow and her husband adopted the boy, and insisted that he should never know that Jennet was his mother. The child's screams that Kipps heard were those of Nathaniel's ghost. Jennet went away for a year. When realising she could not be parted for long from her son, she made an agreement to stay at Eel Marsh House with him as long as she never revealed her true identity to him. She secretly planned to abscond from the house with her son. One day, a horse and carriage carrying the boy across the causeway became lost and sank into the marshes, killing all aboard, while Jennet looked on helplessly from the window. After Jennet died, she returned to haunt Eel Marsh House and the town of Crythin Gifford, as the malevolent Woman in Black. According to local tales, a sighting of the Woman in Black presaged the death of a child. After some time (but still years before the beginning of the story), Kipps returns to London, marries Stella, has a child of his own, and tries to put the events at Crythin Gifford behind him. At a fair, while his wife and child are enjoying a horse and carriage ride, Kipps sees the Woman in Black. She steps out in front of the horse and startles it, causing it to bolt and wreck the carriage against a tree, killing the child instantly and critically injuring Stella, who dies ten months later. Kipps finishes his reminiscence with the words, "They have asked for my story. I have told it. Enough." 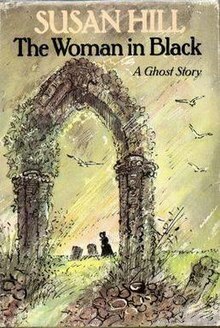 The play of The Woman in Black was adapted by Stephen Mallatratt in December 1987 and started off as a low budget production for the new Christmas play in Scarborough. It turned out to be so successful that it arrived in London's West End two years later in January 1989, taking up residence at the London Fortune Theatre on 7 June that same year and is currently[when?] the second longest-running play in the West End.. For the 30th Anniversary year the West End cast from May 2018-March 2019 was Richard Hope as Arthur Kipps and Mark Hawkins as the Actor, then from 19th March 2019 Stuart Fox with Matthew Spencer. Mallatratt's version sees Arthur rehearsing with an actor in an attempt to perform the story to family and friends, which allows him to relive the haunting of Eel Marsh House as a play within a play. In 1989, the story was adapted for television by Nigel Kneale for Britain's ITV network and directed by Herbert Wise. The production starred Adrian Rawlins as Arthur Kidd (not Kipps), Bernard Hepton as Sam Toovey (not Sam Daily) and Pauline Moran as The Woman in Black. In December 1993, BBC Radio 5 broadcast a four-part adaptation of the novel. It starred Robert Glenister (as young Arthur Kipps) and John Woodvine (as an old Arthur Kipps, who also narrates parts of the story). It was directed by Chris Wallis. In October 2004, BBC Radio 4 broadcast a 56-minute version in its Saturday Play slot, adapted by Mike Walker. It starred James D'Arcy as Arthur Kipps, was directed by John Taylor and was a Fiction Factory production. In February 2012, a film adaptation was released, starring Daniel Radcliffe in the role of Arthur Kipps, and directed by James Watkins of Eden Lake fame. It is a separate adaptation of the novel, not a remake of the 1989 film, and develops a storyline quite different from that of the source material. A sequel of the book named The Woman in Black: Angel of Death was first published in the United Kingdom on 24 October 2013 and was published in the United States on 12 February 2014, written by Martyn Waites. It is a movie novelization of the 2015 film The Woman in Black: Angel of Death. ^ "Blackwell Books Online". Rarebooks.blackwell.co.uk. Archived from the original on 30 March 2012. Retrieved 1 July 2012. ^ "Woman in Black, The [drama]". Radiolistings.co.uk. 24 January 2012. Retrieved 1 July 2012. ^ Nardone, Jamie-Lee. "Martyn Waites Interview: The Woman in Black: Angel of Death". Den of Geek. Retrieved 18 October 2014.